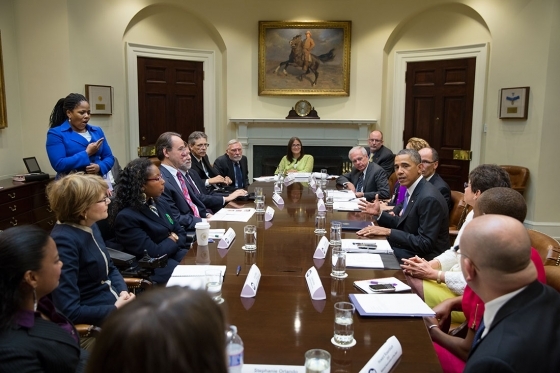 Disability community leaders meet with President Obama, Secretary of Labor Tom Perez, Valerie Jarrett, Paulette Aniskoff and Claudia Gordon to discuss future efforts to fulfill the promise of the Americans with Disabilities Act. Pictured (clockwise from left lower corner): Dr. Anjali Forber-Pratt, Carol Glazer, Andraea Lavant, Henry Claypool, Paul Schroeder, Kelly Buckland, Dr. George Jeisen, Marca Bristo, Paul J. Tobin, Hon. Tony Coelho, Paulette Aniskoff, Secretary Tony Perez, President Barack Obama, Valerie Jarrett, Claudia Gordon, Howard Rosenblum and Stephanie Orlando.